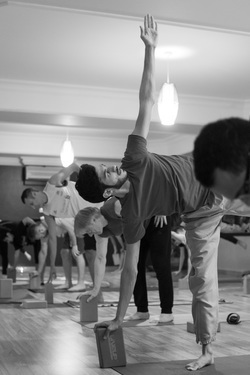 Namaste offers level 1 (200 hours) Yoga Alliance Accredited Yoga Teacher Trainings in Bahrain. 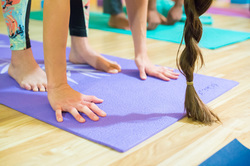 For aspiring teachers and serious students of yoga, Namaste's 200hr Teacher Training is a comprehensive yoga teacher training program that combines the smooth, breath-centered flow of Vinyasa yoga with precise art and science of alignment. Teacher Trainees will begin each day with an in depth pranayama (breathing) and meditation practice followed by an intense asana (postural yoga) practice that focuses on a different family of poses each session. After a thorough physical exploration of an asana theme, the rest of the day is spent learning how to translate this newly and more clearly understood personal practice into effective teaching. Days often include rigorous classroom inquiry, posture labs, self enquiry and practice teaching. Students in the Teacher Training will also study anatomy and physiology, explore yoga’s philosophy, investigate Subtle Body and Ayurvedic Science. Applied Anatomy of Hatha Yoga & Bio Mechanics – learning what happens physically in the skeletal, muscular, respiratory, nervous and endocrine system as we practice yoga; Recognizing, understanding and overcoming physical and physiological limitations and restrictions of various body types. Objective: To truly understand, experience and feel the effects of the Yoga practice on an individual level in a nurturing environment. The transformations experienced through this course can then be shared from a genuine place with the graduate's future students. Pre-requisite: To be accepted onto the level 1 training, students will need to have completed a minimum of 2 years consistent, dedicated yoga practice under the guidance of qualified yoga teacher(s). About the level 1 training: This course offers you a comprehensive, practical training in how to teach Yoga. We welcome experienced practitioners who are ready to refine their skills, in the art of teaching Yoga, and also those who would simply like to deepen their Yoga knowledge and practice. This course will be the foundation of a consistent, dedicated practice of both learning and teaching Yoga. It is a challenging course that aims to provide the opportunity for maximum growth and transformation. You will be invited to take a journey within and be open and dedicated to your practice in order to experience first hand the power of your Yoga practice in order to be able to share it with others. Weam Zabar, ERYT500 certified Yoga Instructor and Level 4 Reiki Healer and the founder of Namaste. Weam's teaching style is fluid, creative and fun. Her Yoga journey started in 2007 and nothing remained the same. Seeing how Yoga nurtured her life she left behind a demanding corporate job to dedicate her to guiding others and sharing their journey home. Namaste since has helped hundreds of students taste the sweetness of the Yoga practice. Louise-Angele Plante, 500 E-RYT certified Yoga Instructor and Thai Massage Therapist ~ with a 16 year background in the Medical field. Lou’s approach to yoga is one that honors the need for individual self-study, devotion and service to humanity. Lou has devoted the past 6 years to study yoga anatomy, yoga therapy, asana, meditation, pranayama and philosophy from a variety of world renowned teachers and schools. Since completing her Advanced Yoga Teacher Training Course with Yoga Arts(Louisa Sears) in Bali, Lou has taught group and private classes in a wide range of environments including, Canada, Sri Lanka, Dubai, India, Bahrain and Saudi Arabia. Lou also teaches Applied Anatomy of Yoga on other teacher training courses. Yoga Alliance: Yoga Alliance is an International Organization for the quality and standardization of individual Yoga teachers and Yoga Schools worldwide. Completing a Yoga Alliance Accredited training will give the student an internationally recognized Yoga Teaching qualification.